Kelley Mitton joins Brandon University to advance co-op, work-integrated and experiential education. Students at Brandon University (BU) will have new opportunities for hands-on learning, thanks to a new hire. 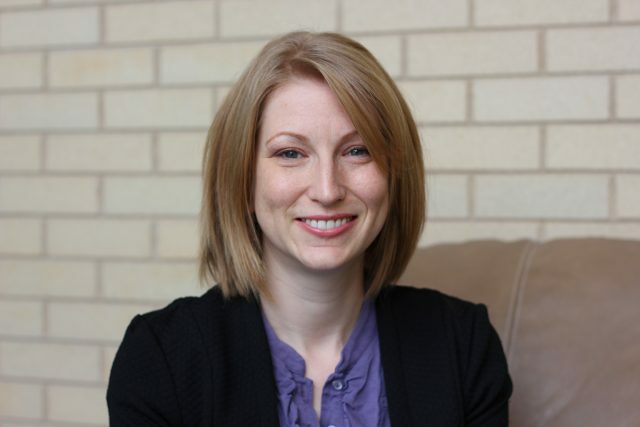 Kelley Mitton started this month as BU’s new Co-operative Program Coordinator. She’ll be helping oversee and develop co-op, work-integrated, and experiential learning options in a variety of disciplines across the university, and she will be coordinating the implementation of BU’s forthcoming Co-operative Education Program. Although direct, hands-on experience has long been a part of education at Brandon University, from science labs and health-care simulations to business plans and music performances, hiring a new Co-op Program Coordinator will allow the university to expand and enhance the types of experiences that students will have as options. Mitton, who grew up in Nova Scotia, has a Master’s of Education in adult education from the University of New Brunswick and has worked and studied in adult education since 2002. She also brings 10 years of experience as a project manager in the training and development industry. This position has been made possible through a targeted operating grant increase from the Province of Manitoba.